Mozilla Firefox is almost the most popular Internet Browser among the internet users. Mozilla is working really hard so that it’s scheduled that there will be a new release every 6 weeks, and it may change it to 5 weeks or less. The last release date for the builds was 13 Oct 2011. Firefox 9.0a2 Aurora / 8.0b3 Beta / 7.0.1 Final were released some time ago. Firefox Aurora 9.0 Alpha 2 ( ~15.28 MB ) and Firefox 8.0 Beta 3 (~14.6 MB ) can be downloaded from Mozilla Firefox Channel. Well, That’s not all from Mozilla, there’s also Nightly Build. Another build like Beta and aurora, but mostly for developers. It contains some more features but also keep in mind that it’s normal to have some more bugs. Here are some of the new and interesting features i found about it. Well, it’s good that Mozilla knows about the importance of the first impression, and since the addons update check is the first thing you see after upgrading from your current build. Mozilla took good care of how it looks , although you probably see it only once, the moment you look at it makes you feel like it’s a built in browser or a browser that is a part of windows 7 or vista.Unfortunately, of course . not all addons will work on it. You’ll have to wait for the developer of the addon to release an update for the new builds.That was one of the main reasons why i stick for a while before doing a big update for Firefox build. 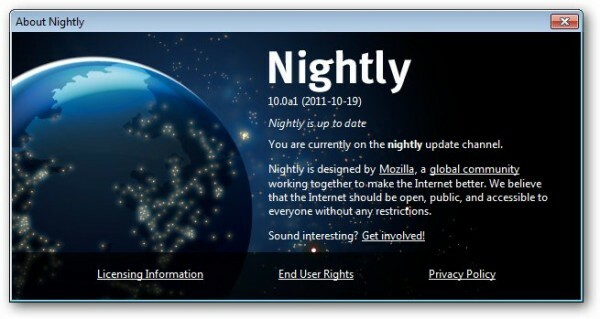 As usual, Mozilla seemed to enjoy copying features from other browsers. 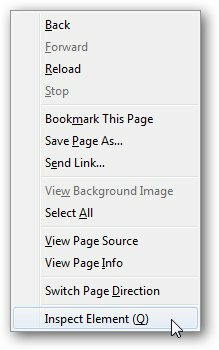 The most noticeable example is the Firefox Button ( which was first used in Opera ). Now Mozilla added a new feature that was in chrome since the very early builds which is the Inspect Element feature, here are some screens. 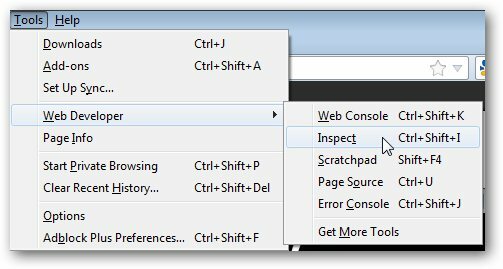 The first screen shows the Inspect Element feature in the context menu ( Right Click Menu ) of the web page. The second one shows how to get it from the tools menu. If the tools menu is not shown. just hit Alt once and you’ll see it. These two screens show the Inspect Element feature in action. So, have you noticed anything else new? Please share it in comments below. 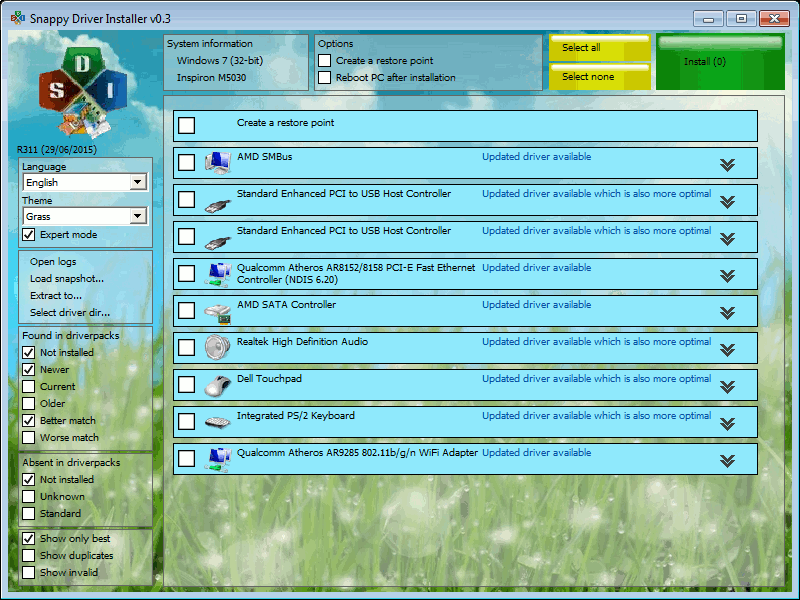 Snappy system driver installer is a freeware for Windows which is an All in One Driver Installer and can be used as a complete solution to install all types of drivers on your system. 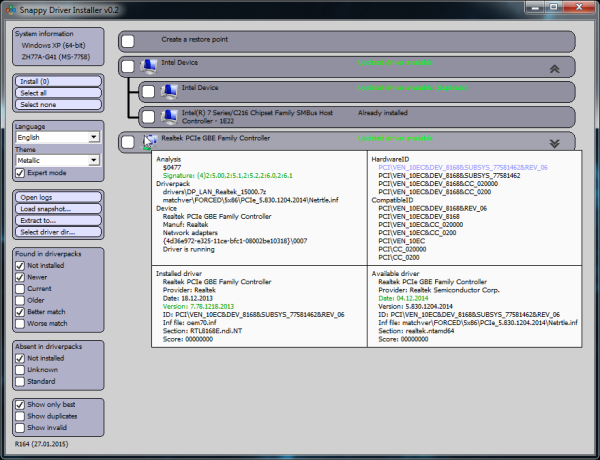 There are two main sources which are supported by the program namely driver packs and local folders. The program is capable enough to pick the drivers automatically from the folder where you kept them and bring it to use at any given time. The computers who have a weak or unreliable internet connection can avail the services of this program as it can install all the drivers without it. 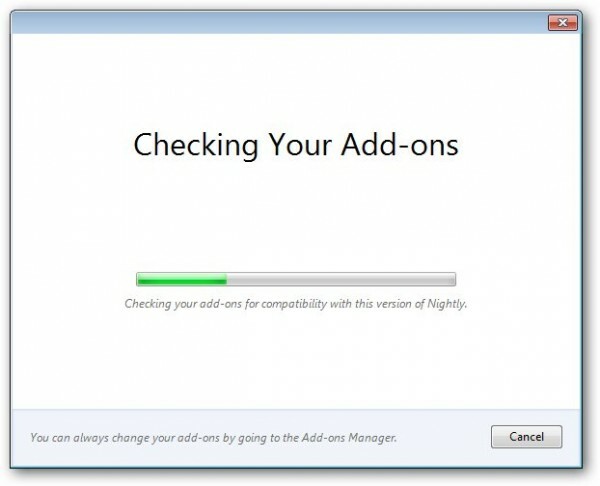 To start installing drivers on your computer, go to the updates option which can be found on the top and download the index file by checking on the option ‘Check only needed for this PC’ and then click on accept. 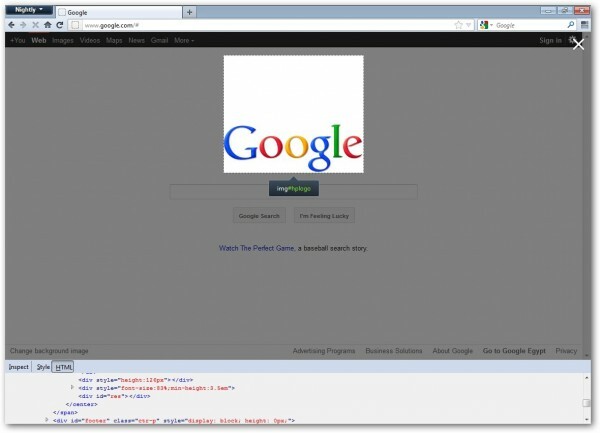 This index file will add all the relevant information to the software. The program then works by checking for all the missing drivers and updates for the already-installed programs on the system. You are also free to download all the driver packs, however, which is not recommended by the experts. 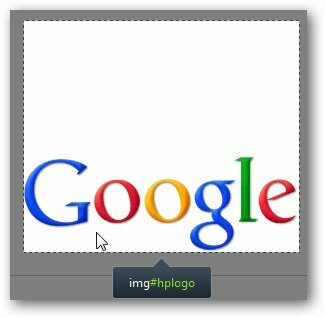 You only need to do this if you need to create a completely portable version of a particular program on the computer which, by default, includes all the drivers. There is one thing to note that you will have to download nearly 9 GB of data in that case. As soon as you are done downloading, the main interface of the program will show the updated driver information afterward. You can also enable the expert mode present on your left where you will be able to use filters to customize the selected option. 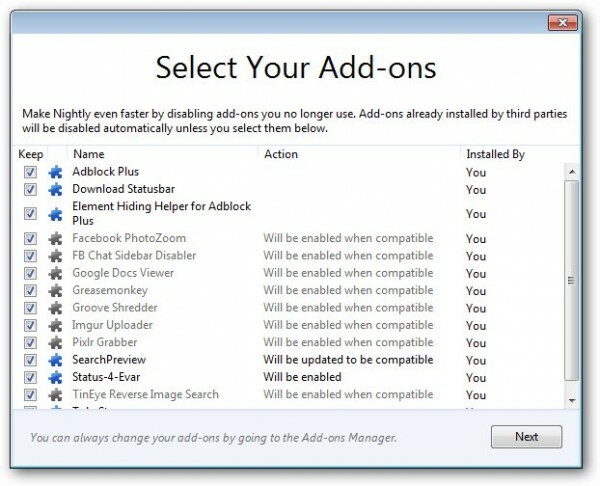 You are also free to disable the updates which you think are, in no way, better than the ones already installed. Before selecting the drivers which need to be updated, hover on each device to get information about each device’s already installed driver and the update the program wants to install. The information may consist of the update’s version, device’s manufacturer’s name, hardware IDs, etc. It is quite beneficial to give some time to these facts as there may be some updates which are not suitable for the device or are falsely identified. Once you are done with all these important steps, the Snappy Driver Installer will start downloading the selected driver updates for your system, installing afterward. Recover deleted photos from phone easily with the world’s number one android file recovery software named Wondershare Dr.Fone. It is a tool which is used worldwide for recovering files and data from android tablets and phones. The tool is capable of retrieving audio files, Whatsapp messages, videos, call history, contacts, photos, text messages and a lot more that you lost accidentally or due to the ROM flashing or OS crash. The tool supports about 200 android devices and many android versions. 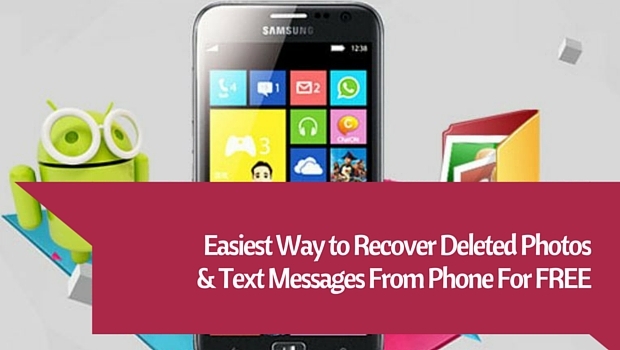 Dr. Fone is very beneficial in recovering files on android devices and can retrieve deleted text messages too. However, if the tool is not dealt properly, the software will not be able to recover all the files properly. Before beginning the process of recovery, the following tips should be considered to increase the success rate positively. First of all, if you find out that some of the files have gone missing on the phone or a list of data is deleted accidentally from the phone, stop using the device instantly. In android or other OS, the data is actually not blown away but is kept in the phone to be rewritten by some other files. For this particular reason, if the device is kept working on, that data gets overwritten by the recent changes in the phone and ultimately, disappears forever. Secondly, look for a computer as soon as possible and start the process of recovery. Don’t forget, the sooner it is, the better it is. Download the recovery software by Wondershare i.e. Dr. Fone for android. For further information, follow the following downloading process. There are more than one way to download Wondershare on your phone. You can either go to the product page to find the app link or simply click the download option on the top of the page to get Dr.Fone on your phone. Once downloaded, your phone will offer an installation package. The download button is also featured in the bottom of the page. Once you have downloaded, search for the installation package on your system. Double tap on the .exe file to run the setup and click on the install option to start the recovery process. The installation process will take approximately a few minutes. 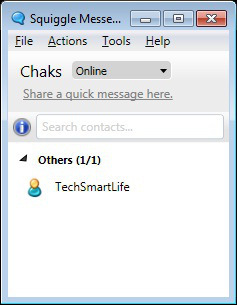 Once there, the Start Now option should be clicked to launch the software. One of the main reason for the success of a business is effective communication. That does not at all means face to face to communication, because of the latest communication tools and software like LAN and Intranet messenger services which are now available and are as efficient as face to face communication. With this technology, you become efficient not only in communication but in time, cost and management as well. But a question always arose that which of them are best. To help you get best for your business, we have listed down the Best Intranet Messengers to be used on Local area network. Realpopup messenger is one of the best known LAN messengers available. It can be defined in a single word “Simplicity”, because of its interface which is user friendly and simple. Your employees become adaptive to it very quickly as there is no any rocket science involved in using it. It can be used by employees from top hierarchy to lower hierarchy. Available on both Windows and Mac OS, it provides all type of communication, written communication through chat feature and verbal through both audio and video call. File sharing is as simple as drag and drop. A new feature is also available which makes you categorize your employees, like creating a department wise groups or in form of hierarchy. Remote assistant feature is also available which enables one user to control computer of the other user to help him without any need to move physically. It is also equipped with administrative controls to limit what your employees do. Output messenger is another cool LAN and Intranet messenger software which is not as simple as RealPopup but full of features and controls. 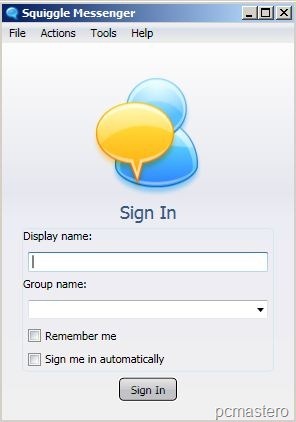 Apart from instant messaging and file transfers, it provides a chat room feature which allow multiple employees to join and share their comments on any events unlike group messaging in which only members of groups are allowed to chat. Remote desktop sharing is also available along with Audio and Video call and conferencing. 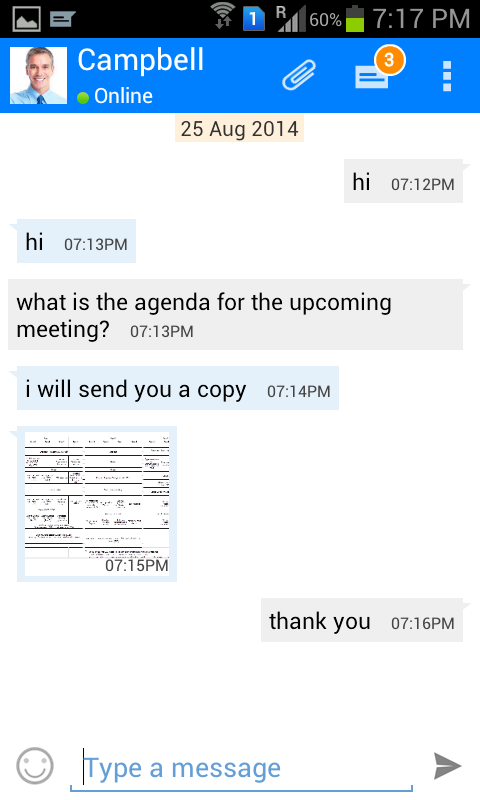 One of the most liked feature is Reminder. You can set a reminder for yourself or for the other user to remind him or her of any task given. It also allows user to set preset messages which will be delivered automatically when anyone tries to contact you when you are in a meeting or other busy activity to avoid nuisance. Users can also install it on their smartphone so that they can also communicate through their phone when they are not at their place and that too without internet. Squiggle is an open source LAN messenger service, which means you can also edit it to match your requirements without any permission from the developer. 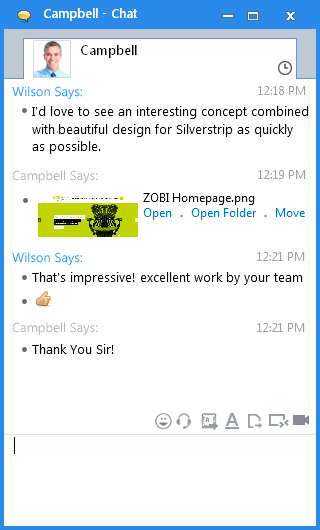 It is a powerful yet very simple tool for instant messaging on LAN or Intranet. It does not even requires installation. Just copy the file and start using it. Private chat feature is also available along with group chat, conferencing and broadcast chat. Moreover, it is also available in your local language, not only tool in your local language but you can also chat in your local language. Some extra files will be needed to download for your local language. 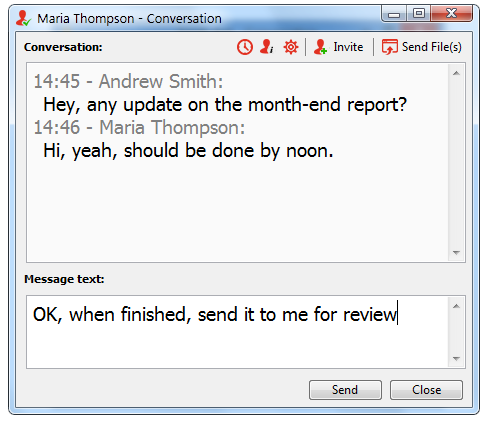 Chat feature is further equipped with other features like emoticons, flash alerts, Buzz and spell check. 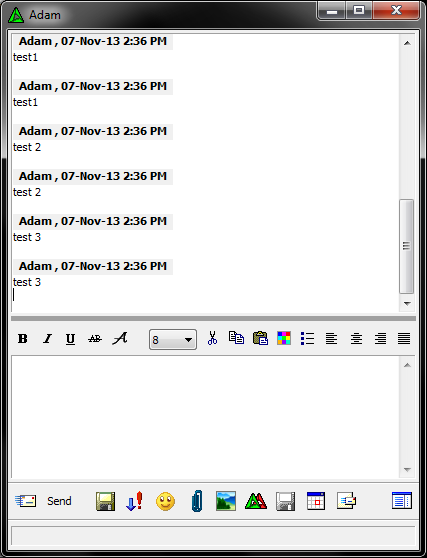 LanTalk has the simplest interface of all Best Intranet Messengers. It is the combination of both simplicity and features. 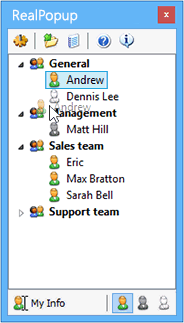 Available only on Windows, it is a multi-level software, means it can be used in small offices to huge organisations. The privacy of conversations is also guaranteed through proper encryption. Surround by so many features, yet it manages to provide real instant messaging through quick reply, quick broadcasting and fast messages. Sending an email in LanTalk is as quick and easy as sending a message. Custom presets are also available so that you do not need to reply to every messages yourself, instead these presets will be sent automatically. Apart from being easy to use, it is also easy to install. Just copy the program on the PC and run it. It will automatically connect you to other users. 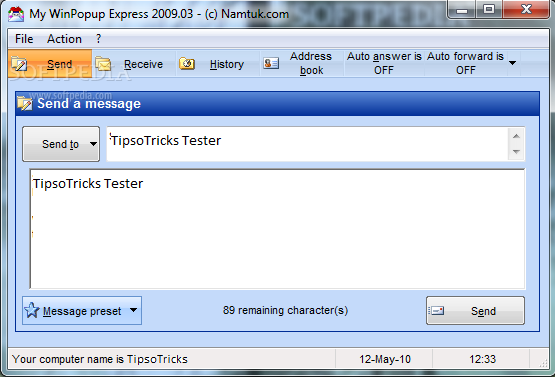 Winpopup is one of the widely used LAN messengers in large business organisations. It provides two modes of operation, one with the server and other without server. The operation with server requires any PC of your LAN to be established as server, mainly the PC of the manager. No server is allowed to be made out of your LAN to keep your privacy. Further, it is equipped with RC4 encryption which makes sure that no information is leaked outside your network. The latter mode of operation is like rest of messengers. To make any announcement urgently, there is an option named as “Group Announce” which sends your announcement and alerts instantly to all employees or group of employees.